CHICAGO – The “Soup Nazi” is in Chicago. Actor Larry Thomas – who memorably portrayed that character on two episodes of “Seinfeld” – has a role in the new Chicago-based independent film “You Don’t Say!” directed by local veteran filmmaker Robert Alaniz. “You Don’t Say!” premieres on Saturday, April 6th, at the historic Patio Theater in Chicago, with a red carpet and after-film Q&A. 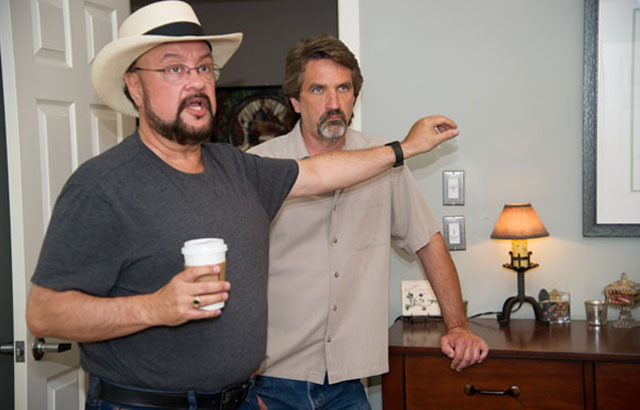 “You Don’t Say!” is Robert Alaniz’s sixth feature film, all independently produced through his Sole Productions company. It’s a comedy about a female corporate climber (Julia Chereson) who gets a mysterious necklace from her boyfriend (Gary Gow), and unknowingly begins to tell the unvarnished truth during a delicate merger between her office and another company. Larry Thomas plays Mr. Melendez, the head of the other company. On the eve of the red-carpet premiere of “You Don’t Say!” HollywoodChicago.com interviewed Thomas, Director Alaniz and several of the main cast members. HollywoodChicago.com: As a veteran character actor, what is your process from script to performance in taking on so many of the different roles that you do? Do you rely on your own interpretation or in collaboration with the director? Larry Thomas: I like to collaborate with the director, but then again when I have to read for a part, it’s usually my own interpretation that gets me cast. In ‘You Don’t Say!’ Robert really trusted me, so it was a total collaboration. This was a case in which I wanted to know how Robert saw the character, and in this case it was clear to both of us. In shooting the scenes, it wasn’t so much about the rehearsal, but in both of us agreeing with each other about the role. HollywoodChicago.com: In the last couple weeks, you were involved in a controversy regarding a gun manufacturer using your image on a tee-shirt. What was the background of that incident, how do you control your image as the ‘Seinfeld’ character, given that people would think that they could use it in such a way? Thomas: My face is my face, and long ago Castle Rock Productions, and now Sony and Warner Bros., who have all inherited certain rights to ‘Seinfeld,’ has agreed with me, although they own the character from the TV show. The face of the character is mine, and I have certain rights about how it is used. Warner Bros. can market items with my face on it, but that’s only because I signed a contract when I did the show. My issue with the gun company [who used the face of Thomas with his catchphrase ‘No soup for you!’ substituting a gun brand for the word soup] was that they don’t have any rights to use my face. If I had taken this case to Sony or Warner Bros., and told them they were using the Soup Nazi to sell guns, they would have buried the guy. I just told him he couldn’t use my face to sell his guns. HollywoodChicago.com: What was the reaction to that? Thomas: It turned into an issue regarding gun control. On Facebook, they wouldn’t take down my post saying I didn’t want my image used without my okay, and suggested I go to the press, so they could use it even longer. The gun company offered me money, but I didn’t accept it because I hadn’t decided where I stand on a guy who manufactures guns. It got political fast, faster than I wanted it too. I was suddenly on TMZ and MSNBC, and I had to decide where I stood. It was easier when the NRA guys started attacking me on Facebook. To defend myself, I reminder those guys that if they were going to follow all the amendments in the Constitution, they also had to follow the 5th Amendment, which states you can’t take a person’s life, liberty or property without due process of the law. I thought that was a good point, but that didn’t work with the gun advocates, who just insulted me. Even the owner of the gun manufacturer told his Facebook audience today to stop calling me names, that I have a right to my opinion. As an actor I was outed politically, which it okay for Brad Pitt, but for me I still have to do auditions, so I can’t be political. It turned ugly and silly really fast, and it was a bad bit of fate. HollywoodChicago.com: Which of your many character roles over the years is closest to who you actually are? Thomas: There are two answers. It entirely possible, oddly enough, that the Soup Nazi is closest to who I am. It’s not really a joke, because my son will tell you that I would fret like that when trying to get him to school. 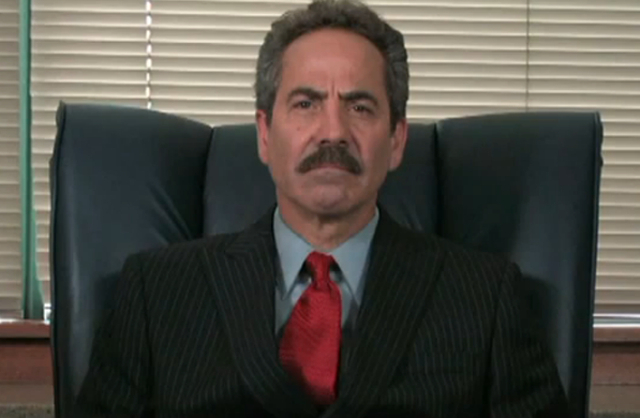 He would stand at the door and say, ‘all your anger and frustration won’t get us to school any faster.’ So the Soup Nazi isn’t so scary once you get to know him, which is like I am, and I can be diffused in a similar way. The impatience of the character was pretty darn close. The second role is one I did on stage, it was as an attorney in the play ‘Nutz,’ which was totally different from the Barbra Streisand version. In the stage play, the defense lawyer character had guile, intelligence, craftiness and tomfoolery. This guy was a trickster, like my father, who was a con man. I have a con man in me that I don’t use, but I got to do it in that role. HollywoodChicago.com: What is the strangest or most obscure encounter in public that you’ve had in association with the Soup Nazi role, either someone recognizing you or hearing the catchphrase? I kept a poker face on the whole thing, even though the guy next to me was elbowing me. After she left, I told my seat mate that it was the best reading of the line I’d ever heard. It was perfectly deadpan. [laughs] It turned out she’d never seen the show. Robert Alaniz is a veteran Chicago-area filmmaker, and “You Don’t Say” is his sixth feature film. His film “Barrymore’s Dream” (2005) won best feature at the Route 66 Film Festival in 2007, and he received the Illinois Auteur Award for “D.I.N.K.S” (2011) at the Illinois International Film Festival. HollywoodChicago.com: What inspired the idea for this film, and what element of somebody being completely honest in the corporate world appealed to you? Robert Alaniz: The basis for the story was due to my frustration on how our society has changed in the past 30 years. There was a time when you were looked up to if you spoke your mind, but lately it seems you can’t say anything without offending somebody or some group. That gave me the idea for the film, in which a corporate woman is given a mystical necklace and starts to say what is on her mind, and how people would react to that. HollywoodChicago.com: Since you’ve worked on virtually every job associated with producing a film, how does that help your process in putting together ‘You Don’t Say!’? Alaniz: Well, considering I learned to do all those jobs because I couldn’t find anyone else to do them, it does give me a better perspective of what every job is, and what they have to go through. As Editor, I know exactly what the job is, so if I ever work with an Editor separately, I’ll know exactly what he will be talking about. That includes just about every job I’ve ever done, including camera and whatever else there has been. Hopefully, down the road that will help me with those people in those particular positions. HollywoodChicago.com: You call this film ‘a comedy with a voice.’ As a screenwriter, what thread or voice runs through your films, that you feel is completely and distinctly your own? Alaniz: I try to put a lot of truth in all the films I’ve done, and I try to base all my characters in reality. In comedy, you can take liberties and have over-the-top characters, but even in those films I like the characters to be real, like the people you meet on the street. The one thread that goes through all the films is that I like to put ordinary people in extraordinary circumstances, that they have to overcome. In my first four films, that was based in drama, and in my last two, it’s based in comedy. It works in all formats, but I noticed that in comedy it works even better. When people look back on my films, I think that’s what they’ll find, the ordinary person who falls into the extraordinary situation. HollywoodChicago.com: As a veteran of films with lower budgets, what is your best tip to aspiring filmmakers for getting a smaller budgeted film over the finish line? Alaniz: Patience and persistence produces perseverance. In other words, you have to stick with what you’re doing and not give up, which is a very difficult thing to do. The biggest obstacle for independent filmmakers is money, but you can only do with what you’ve got, and the biggest challenge it to have the film look like a big budget Hollywood movie. What I want to add to that, and what I learned for this film, is that you need to have people like Larry Thomas and my composer Alan O’Day [‘Undercover Angel’ ‘Rock n Roll Heaven’] which helped me to market the film, and that is everything. The more professional people you work with, makes you more professional. We’re all looking forward to Saturday night, and are very excited about it. Julia Chereson portrays Bobbi in “You Don’t Say!” and Gary Gow portrays her boyfriend Jerry. Playing Bobbi’s relatives are Laura Ann Parry (Madelyne) and Hayley Camire (Dee Dee). Chereson, Parry and Camire are making their feature film debuts, and Gow has been in all six Sole Productions films. HollywoodChicago.com: Julie, since this was your debut feature film role, what do you differently as an actor to prepare for on-screen work versus stage and improvisation. What was the best way for you to stay in character between takes? Julie Chereson: What helped me make that transition was the rehearsal process. Robert had an entire rehearsal process for every scene we filmed. There were camera and lights at those rehearsals, so I got an idea of the atmosphere from those situations, and that helped me adapt my theater skills to film skills. HollywoodChicago.com: What was the best piece of advice someone gave you about acting, and how do you honor that piece of advice in your performance in ‘You Don’t Say!’? Chereson: I had the best professor in college, he was the epitome of instructors for my acting experience. He was a true inspiration. I was in a company of ‘A Funny Thing Happened on the Way to the Forum’ and one rehearsal we were all just off. So my professor said to us, the most profound and absurd note he has ever given to the cast, ‘Guys, just act better.’ It was so funny, but made so much sense, because we weren’t being present or in the moment. Just the fact that he said it, in the way he did, got us back on track. From that moment on, whenever I feel myself getting too comfortable in performance, I think of that simple advice to stay present, and that makes my acting worthwhile. HollywoodChicago.com: Gary, this is your sixth Sole Productions project with director Robert Alaniz. What have you observe about the evolution of Robert as a director through these productions, and what do you like most about the role in ‘You Don’t Say!’? Gary Gow: Robert has really evolved as a director and editor. For each film, he learns from the process and builds on that to make each film along the way that much better. I think ‘You Don’t Say!’ is his best film. From technical aspects to directing actors, he really does learn from each process, and takes it to the next level. It’s always exciting to do a feature with him, because you know it’s going to get better. HollywoodChicago.com: The movie is about you, a middle aged man, dating a younger woman. What do you thing is easiest about that in real life, and what do you observe to be more difficult, and did you add those observations into the character? Gow: In real life, through my observations, I think those relationships are doomed. [laughs] It’s not a relationship I’d put myself in, because you don’t have enough in common with someone that different in age. In the script, we’re 15 years apart, and in real life Julia and I are 25 years apart. So yeah, I’d never be a Jerry in reality, because I wouldn’t be in that relationship. But as Jerry, I put it aside and not think about, and made the relationship work. It all worked out. HollywoodChicago.com: Laura, what is an example of an expectation you had before you went on your first feature film, was that expectation fulfilled, and how did you experience it when you actually got on the set? Laura Ann Parry: First of all, the audition was more intense than anything on set. [laughs] There was a lot of us waiting outside the audition room, and when I got inside the room there was a table filled with people associated with the production. There were still cameras, live cameras, sound equipment and lights, it was a bit overwhelming. But once I got to the set it was much less intimidating, since I already went through it at the audition. When I got to the set it was much more comfortable, due to the preparation process that Robert put into place. HollywoodChicago.com: Which film in movie history would you have liked to have been cast in, either in a lead or supporting role, and why? Parry: Okay, I’ve always wanted to be Scarlett O’Hara in ‘Gone with the Wind.’ [laughs] And the reason why is that she is the quintessential diva. I fell in love with the book when I read it, and when I saw the movie I loved the colors in it, during the burning of Atlanta. Also when Scarlett shakes her fist at the sky, I fell in love with that character, and I always wanted to play her. HollywoodChicago.com: Hayley, you studied performance in New York City. What was behind your decision to come back to Chicago and pursue professional acting here, rather than a more conducive environment like New York City? Hayley Camire: I actually came back here because of family concerns, after graduation. Starting out in Chicago was the smartest choice I made. It was an easier transition with friends and the work ethic here than being in New York City. I also feel I can organize the work and the auditions better here. For example, this was my first film, it was a wonderful opportunity and it came up at a great time. HollywoodChicago.com: Now that you have one feature film under your belt, what do you think you learned about acting on camera, and what will you change the next time you do a film? The red carpet premiere of “You Don’t Say!” is Saturday, April 6th, 2013. The Red Carpet and film are scheduled for a 7:30pm start at the Patio Theater, 6008 W. Irving Park Road, Chicago. Featuring Larry Thomas, Julie Chereson, Gary Gow, Laura Ann Parry and Hayley Camire. Written and directed by Robert Alaniz. Not Rated. Click here for more information and online advance tickets – a discount from the box office – until 2pm on April 6th.